Love is described in the dictionary as an intense feeling of deep affection. That may be true, but if the characters in Paradise, currently playing at the Odyssey Theatre, have anything to say about it, people will begin to look at love as more than a feeling and realize it’s scientific. There just may be real science behind romantic love. Who knew? 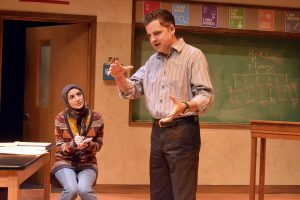 No one actually thinks about the science behind love, but as one of the characters in the play puts it, What’s Love Got To Do With It?, (not referring to the song by Tina Turner, but rather a book one of the characters wrote). This poignant, often quaint, stimulating drama about science, culture, religion and more, is presented by Viola Davis and Julius Tennon’s JuVee Productions, and American Oasis, and directed by Vicangelo Bulluck. 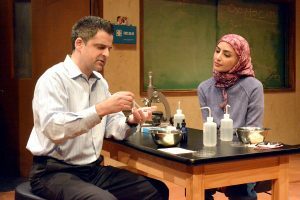 Medalion Rahimi plays Yasmeen, a gifted Yemeni-American high school senior at a poorly rated school in the South Bronx. She holds her disillusioned biology teacher, Mr. Marlow (Jeff Marlow) in high esteem and seeks his assistance in helping her to get a scholarship to a prestigious school by working together on her science project. The two form an unlikely scientific partnership until a conflict arises over differences in culture, religion and the boundaries of mentorship, their capacity to alter the course of each other's lives becomes greater than either had imagined. Mr. Marlow is a no-nonsense, somewhat cynical teacher, unhappy with his current circumstances. 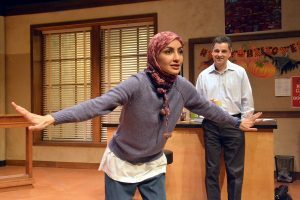 Yasmeen is a wide-eyed, the cup is half full, kind of student - bent on making her way in the world - on her own terms. A girl who is all in when it comes to her faith, she will not be behind closed doors with a man. She has accepted (or has she? ), the fate of an arranged marriage with a man she doesn't know very well. After all, it's tradition! This complex show is set to present day in the science lab of a large inner-city Bronx high school. At times the dialogue is a bit tedious and heady – giving the feel of actually being in an advanced science class. That being said, pay close attention to the words or you could get lost in the science mishmash. There is good chemistry between Rahimi and Marlow who both turn in stellar performances. Bulluck makes good use of a small space – utilizing most of the stage. His direction puts the audience smack dab in the classroom. The West Coast premiere of the play, Paradise, a visiting production at the Odyssey Theatre, is written by Laura Maria Censabella, directed by Vicangelo Bulluck and executive produced by Viola Davis and Julius Tennon. 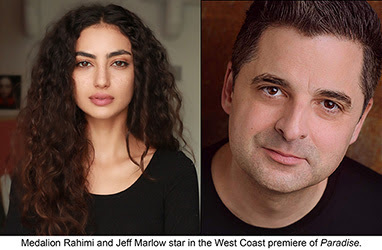 It stars Medalion Rahimi (Still Star-Crossed) and Jeff Marlow (Henry IV). The award-winning creative team for Paradise includes scenic and lighting designer Jeff Rowlings, sound designer Jon Gottlieb, costume designer Mylette Nora and casting director Michael Donovan, CSA. Also on board are scientific advisor Colin Cox and cultural advisor Roxi-Rabab Muthana. The production stage manager is Jenine MacDonald and Racquel Lehrman, Theatre Planners is general manager. Paradise, Odyssey Theatre, 2055 S. Sepulveda, 8 p.m., Fri.-Sat. ; 2 p.m. Sun. through February 17; $35; (323) 960-7724 or www.Plays411.com/Paradise. On the DONLOE SCALE: D (don’t bother), O (oh, no), N (needs work), L (likable), O (oh, yeah) and E (excellent), Paradise gets an O (oh, yeah).